» Forum » All Pinball » Could pinball make a comeback through casinos? » Could pinball make a comeback through casinos? Could pinball make a comeback through casinos? Have a listen to this story that aired this morning. Younger generations not interested in games of chance, they want games of skill. Casinos may push in that direction. Pinball, anyone?! Never happen. Casinos don't want things that are labor intensive. Plus, some of those laws that were just taken off the books in the past few years dealing with pinball machine restrictions, gambling, and unsavory atmospheres? If pins find their way into casinos, history may start to repeat itself and put those kinds of laws back into effect. No way. Pins take up space where they could have slot machines. Pinball machines will never earn 1/100th of the amount of Social Security senior citizens pump into those slot machines. The only place possible is in the arcades where parents dump their kids while they gamble. The truth is those arcades are just gambling redemption devices where the kids play for tickets for cheap toys. I guess this is why a couple of my machines have had weird holes drilled into the cabs a couple of inches apart for permits??? Are they still considered gambling devices???? I doubt pinball will be the solution, but there is a push beginning by casinos to include games of skill for gambling purposes. Some experiments were going on with free throw-type games. So make it a virtual pin. Pinsiders are only going to offer their "expert" opinions. They are not going to listen to what some experts say is coming up in the world of gambling. 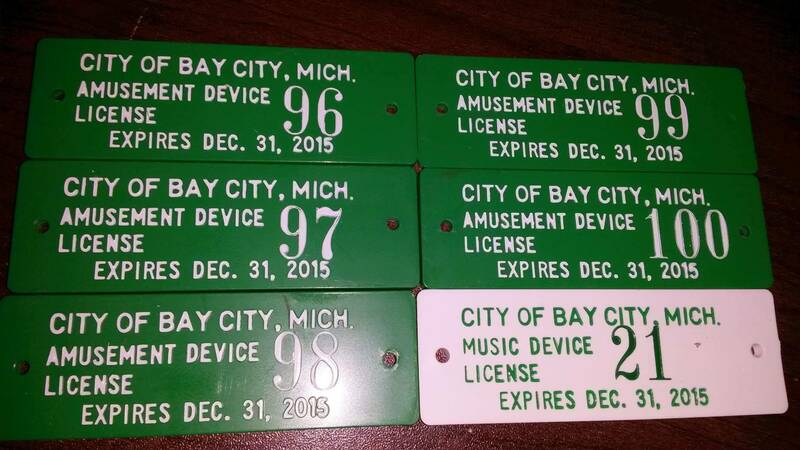 Some cities require a license to operate coin-op amusement or music devices, they supply tack nails with the licenses. How dare you accuse.... Ok yeah, I didn't listen. Didn't change what I posted. Did you read it ? It didn't say anything about those experts being in the casino business. If there was money to be made off of pinball in casinos, casinos would have lots of pinball machines. The people running casinos have a pretty good idea on how to make lots of money. Casinos aren't going to do anything that would change the odds to the player's favor, period. MEYERHOFER: The casinos, to offer this, they're going to on the whole have to still make a profit. But people on a given night, or with their skillful performance, could feel pretty confident they're going to walk away with something. Aren't pinballs already in good shape in terms of sales, do we really need casinos to help with a comeback?! While there are a lot of redemption games, there are still a lot of arcade games as well. Pinball is less prevalent than racing and gun games, but there are some. The Peppermill here in Reno has AC/DC, Metallica, and Mustang. Atlantis has Walking Dead, and Circus Circus has Star Trek. Other casinos have older games. Casinos usually have all of the latest arcade games, most of which make pinball machines look pretty cheap. I just don't know if pinball gets played enough to make the extra maintenance worth it. I don't know if skill based gaming will actually happen though. It would still have to be in the house's favor even with perfect play, so it probably wouldn't attract very many players long term. I dont think it will happen, but I think it should. eyes of the pure...but I dont think that will happen either. Look, every show today has a tournament with money in and cash prizes out, thats OK.
We go to hotels and participate. Would we mind if a National Tourney was held in a Casino? The Publicity? Certainly to some, tournaments are gambling. dates...its an old persons game. Well Casinos will need a way to respond, and I do believe since the interactive slots are the only success stories, that it is possible to see more in this direction. Sure, a Halo slot, but the guys are going to want a good long video mode to rack up kills and dough...eventually the slot part may go away. Now payout pinball can be easy...all the things we do to put in our initials could be payouts, even Special when lit...or you could build a game around risk reward for money....points and $$$, but also a way to lose those $$$. I could see it, and I could see many great games, themes, and play. Just like slots that come home, this could spur dozens of titles made a year. Safe Cracker, vaults, Smaugs Gold coin dispensed on a win, Zombie Kill payouts, win a Ford Mustang, Progressive Star Trek Jackpot to include a walk on part in a movie? But, what about the real good players? Could they not rake in money? on the flippers to adjust to "winners". I think it would be a young crowd draw, and a good thing. of Anti-Pinball witch hunts again, I know Id consider more trips to Vegas, if I could pump $50 into a pin, and Win $10, $100, $1000? Some luck, most skill....I'm game!